Last year you bought a gymnastics leotard pattern with classic, plain front for your daughter. Like easy-to-make 3138. However, this season, after browsing on Pinterest for a little too long, she found THE leotard. The style every cool kid at the gym is begging their mom to buy (or make). A beautiful two-tone leo with a bright, oddly-shaped appliqué between the two colours. You look online but obviously cannot find a pattern with the exact same cut your daughter has been dreaming about. The solution? 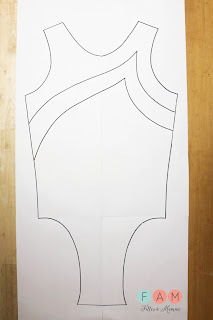 Draw on your pattern and cut! It is actually much easier than it sounds. You will not have to buy another pattern or a RTW leotard! Mel Henry from Filles à Maman (who is also a Super Mom to a stylish teen) shows you how to do that. A step by step color-blocking tutorial, with lots of beautiful photos. Take a look, find your craziest fabrics to mix and match and have fun!